The AcistBox is a mobile stormwater treatment system that uses polymer-enhanced sand filtration (CESF) technology. 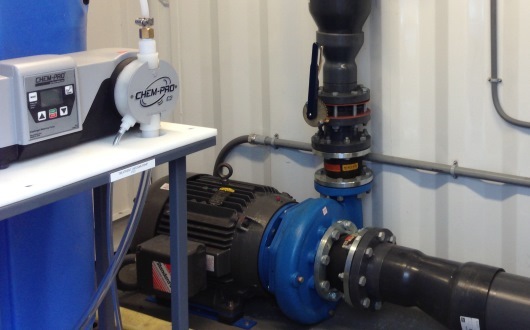 This turnkey system controls pH and reduces turbidity to levels that are acceptable for discharge. The process is completely automated and includes real-time water quality monitoring, data logging, and a water quality recirculation valve that ensures effluent water meets user-defined discharge criteria before leaving the system. In Washington state, the system is approved as a General Use Level Designation technology when using Chitosan or other approved polymer products. 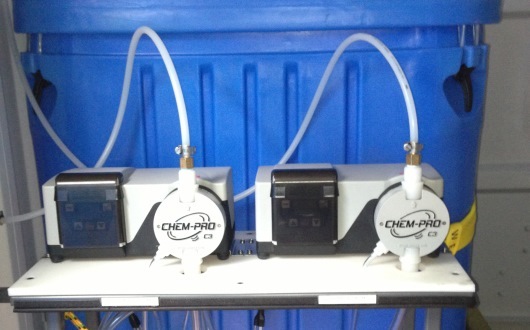 Completely automated, turnkey system with process flowrate of 100gpm - 1,000gpm to control pH and reduce turbidity. 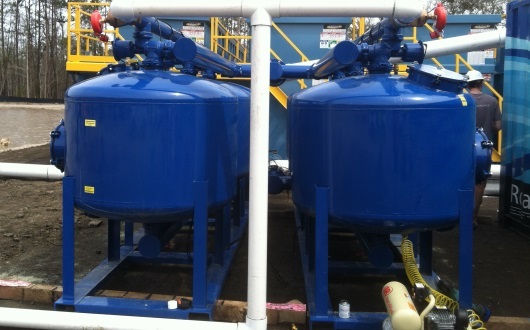 The system consists of three steps: influent water is pumped though & analyzed, polymer is injected & mixed, and then sent to a media filtration system. Real-time water quality monitoring, data logging and water quality recirculation valve ensure effluent water meets user-defined discharge requirements. Approved as a General Use Level Designation (GULD) technology by the Washington State Department of Ecology when using Chitosan or other approved polymers. Water is collected in a source tank or pond and pumped through the AcistBox by a treatment pump. Influent water quality is analyzed for Turbidity and pH and recorded on the internal system log. Polymer is stored in chemical totes inside the system container and is injected into the influent water via automated and adjustable dosing pumps. It then goes through a flocculation chamber with serpentine piping and static mixers to enhance mixing of the polymer. Water is then sent to a media filtration system that includes an automated backwash function. Finally, water is analyzed for effluent Turbidity and pH to ensure the water meets all operator-defined criteria. If the water does not meet criteria, it is re-circulated to the beginning of the process via an auto-actuated water quality valve.